For media inquiries and screeners, please contact tim@kartemquin.com. "Every politically conscious American owes it to themselves to see this riveting, maddening picture. It’s one of the year’s best documentaries." "An up-close view of one of the meanest and most dramatic chapters in recent American politics: the battle over collective-bargaining rights for Wisconsin state employees and the subsequent effort to recall the Republican governor, Scott Walker, from office... has a narrative drive unusual for a 60-minute television documentary, pulling us along like a political thriller. " "It’s like a punch to the gut. The film is unsparing in its depiction of the convoluted politics that produced a Governor like Scott Walker, and, more pointedly, how good, hard-working people have been laid low by an unforgiving economic downturn." "Balancing multiple threads, Lichtenstein’s eye-opening doc reveals the heavy price of partisan politics, corporate greed, and failed economic policies – with the average citizen left wondering how s/he will pay the bills." "Even if you know little about Wisconsin politics or Janesville, you will come to admire the grit and determination of the laid-off workers, who struggle to find work, maintain their home lives, and persevere amid the hardships." "This film serves as a correction to the anonymity inherent in the term “depressed economy”... Instead, we watch normal people engage in real conversation about their hopes, their fears and their stark realities." "Movies often sacrifice the statistical evidence to a good story. 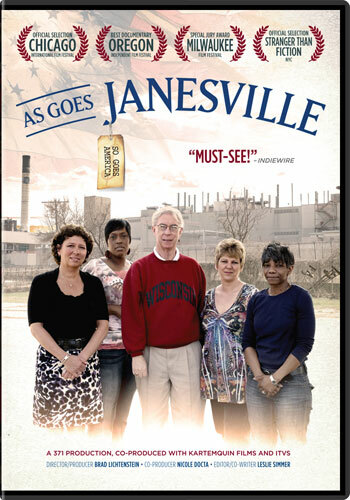 "As Goes Janesville" does not." "You see, up close, the transition that our economy is going through everywhere." "This is a story in America that is so common, and yet so unknown." "It’s rare to see ongoing political debates rendered so tangible onscreen... essential viewing for anyone trying to understand the other side’s reasoning—but more impressively, it never loses sight of its story’s human dimension." "Chronicles, contextualizes and explores with incredible sensitivity as it personalizes the story of what's happening to the middle-class in the middle class in this country"
"A terrific look at the struggle between business and humanistic concerns that exists today in our country." "This film is not to be missed"